A team of expert marine biologists and chemists has carried out research which proves for the first time that oceans and shores are contaminated with microscopic fragments and fibres of plastic. Eight scientists from the Universities of Southampton and Plymouth and the Plymouth-based Sir Alister Hardy Foundation for Ocean Science have today (Friday 7 May) published their findings in the prestigious international journal Science. The article 'Lost at Sea: Where Is All the Plastic?' provides a snapshot of the extent of contamination of marine habitats by microscopic plastic fragments. The results of the project, which was funded by the Leverhulme Trust, show conclusively that microscopic plastics are now common in marine habitats. It is already known that large items of plastic debris are accumulating in the seas and on shorelines, harming marine life including turtles, fish, seabirds and mammals. Samples were collected around the Plymouth coastline and then analyzed at Southampton by University chemist Dr Andrea Russell using a technique called Fourier Transform-Infra Red spectroscopy. Various fibres were identified, including nylon, polyethylene acrylic and other synthetic polymers. These polymers are used for a wide range of domestic and industrial products, such as clothing, packaging and rope, which indicates that these fragments are the result of larger items disintegrating. Speaking about the research Dr Russell said: "Some of the particles we identified in the samples were of natural origin and others could not be identified. However, about one-third were synthetic polymers and we conclusively identified nine of these. They were present in most samples, but were considerably more abundant in subtidal sediment." Dr Richard Thompson, Senior Lecturer in Marine Ecology at the University of Plymouth and head of the research team, commented: "Given the durability of plastics and the disposable nature of many plastic items, this type of contamination is likely to increase. Our team is now working to identify the possible environmental consequences of this new form of contamination." 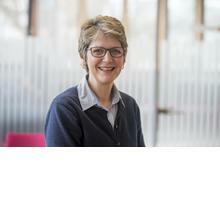 Andrea Russell is Professor of Physical Electrochemistry. Her research interests are in the application of spectroscopic methods to study the electrode/electrolyte interface, with particular emphasis on electrocatalysts and electrode materials for fuel cells, metal-air batteries, water electrolysers, and gas sensors.